Taylor Gibson, 17, of the North Salem Vikings Army JROTC from Oregon, returned to the JROTC Three-Position Air Rifle National Championship with an abundance of aspirations in her mind – ready to defend the precision title she earned at last year’s event and to give a repeat of her record-setting performance. After weekend competition was complete, Emma Thompson ran over to congratulate Taylor Gibson on her win. Gibson and over 200 other juniors competed at the Civilian Marksmanship Program’s (CMP) Gary Anderson Competition Center at Camp Perry, March 22-24. The championship is the completion of a series of three-position air rifle events that begins in October and combines the talents of junior athletes from around the country with two days of competition and finals. Last year, Gibson fired a new Army JROTC National Record 3×20 score of 597-48x. This year, she came only one center-shot away from tying that score on the last day of qualifying competition. With only the finals left to fire in her 2018 showing, she set her sights on a new goal – an overall score of 700 for the day. After starting out a little shaky in the final with two “9” shots, she picked herself up and fired seven straight pellets through the black―ending just shy of her goal with a score of 699.9. “Next year, I’ll do it,” she added. Her overall two-day aggregate score of 1293.1 was enough to blow passed her peers by more than 10 points and give her the championship title for the second year in a row. The win was the satisfying end result of a year full of self-discipline, both physically and mentally, and keeping herself set to an objective she was sure she could reach with concentration and determination. After earning the runner-up position in 2015 (as an eighth-grader) and 2016, Gibson finally claimed the championship title in 2017. Next year, she’ll return as a senior, looking to maintain that title for the third straight year. 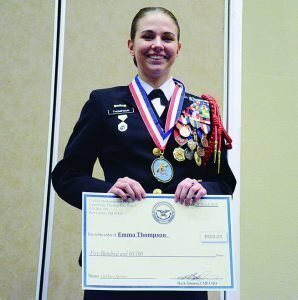 Winning the 2018 sporter individual competition was Emma Thompson, 17, of Freeport High School Navy JROTC from Illinois. 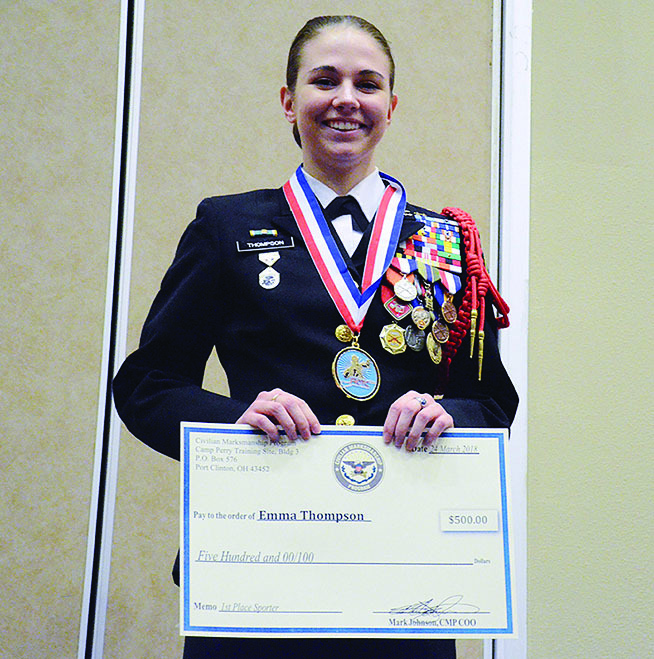 A senior, Thompson was primed to win the event after suffering a bad cold at last year’s JROTC Nationals and landing just short of victory in the second place spot. Emma Thompson was the overall winner of the sporter competition by more than a 20-point margin. This year, Thompson secured a comfortable lead early in the competition and maintained her confidence throughout―claiming the championship title by a margin of more than 20 points above her competitors. 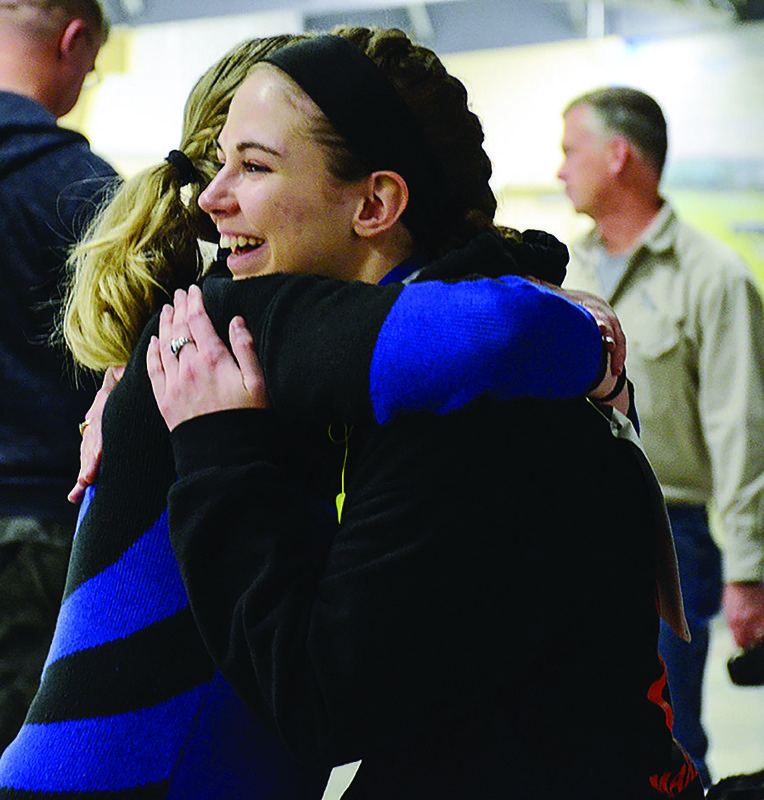 After Day 2 finals were completed, and the announcement of Gibson’s record-setting performance was made, a gleeful Thompson ran across the range to congratulate her friend on her win with a tight embrace. The two accomplished competitors have become close over the last three years, even competing together and winning the American Legion National Championship in 2016 in their respective classes. 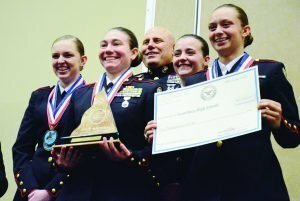 For their win, both girls had the opportunity to attend the American Legion’s National Convention in Cincinnati that same year. In the future, Thompson plans to attend the University of Illinois to study aerospace engineering under a Navy ROTC scholarship. Earning second place in the sporter competition was Elijah Kalinski, 15, of Cibola High School from New Mexico, with a score of 1198.2. Jesseca Montcrieff, 17, of Oviedo High School from Florida overtook the third place position by only 0.7 points – recording a score of 197.7. Following behind Gibson in the precision class was Philip Becker, 16, of The Woodlands College Park High School from Texas, with a score of 1281.2. Allison Henry, 16, of Granbury High School from Texas, rounded out the Top 3 places, falling just short of Becker with a score of 1279.5 for third. Santa Fe High School from New Mexico overtook the sporter team competition. Sporter: 1.Santa Fe High School, NM – 4386-156x – Winning members Dominick Cordova, Bianey Nunez, Gabe Gonzales, Angelica Segovia; Team coach, Master Chief Dale Mayes, USN; 2.Jack C. Hays, TX – 4368-131x, and 3.Oviedo High School, FL – 4349-125x. Precision: 1.Granbury High School, TX – 4689-312x – Winning members Makenzie Sheffield, Allison Henry, Kelcy McGrath, Trinity Hathaway; Team coach, LtCol Scott Casey, USMC; 2.Eldorado High School, NM – 4666-294x, and 3.East Coweta High School, GA – 4636-264x. Placing teams earned monetary awards from the CMP for their outstanding performances―$500 for fifth, $750 for fourth, $1,000 for third, $1,500 for second and $2,000 for first. 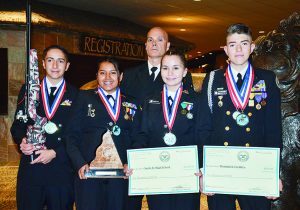 In addition, Larry and Brenda Potterfield, co-founders of the MidwayUSA Corporation, provided generous fund donations to winning teams of the JROTC Championships to be placed in each team’s endowment account with the MidwayUSA Foundation. The CMP, guests and competitors were fortunate enough to be able to personally show their gratitude to the Potterfields at this year’s National event, with both Larry and Brenda attending Day 1 and even passing out medals to the day’s finals winners. Along with talented juniors taking home overall wins in the competition, over 35 Junior Distinguished Air Rifle Badges were awarded at the awards banquet, held this year at Kalahari in Sandusky. Of those, 17 had earned their badges while competing in the National Championship. The CMP was proud to exhibit the talent and efforts of each junior participating in the JROTC Air Rifle Championships. Congratulations to all, and we look forward to next year! For a complete list of results, visit the Competition Tracker page. Granbury High School from Texas came out on top of the precision team match. Championships in February at Camp Perry, Ohio; Anniston, Ala.; and a western location. 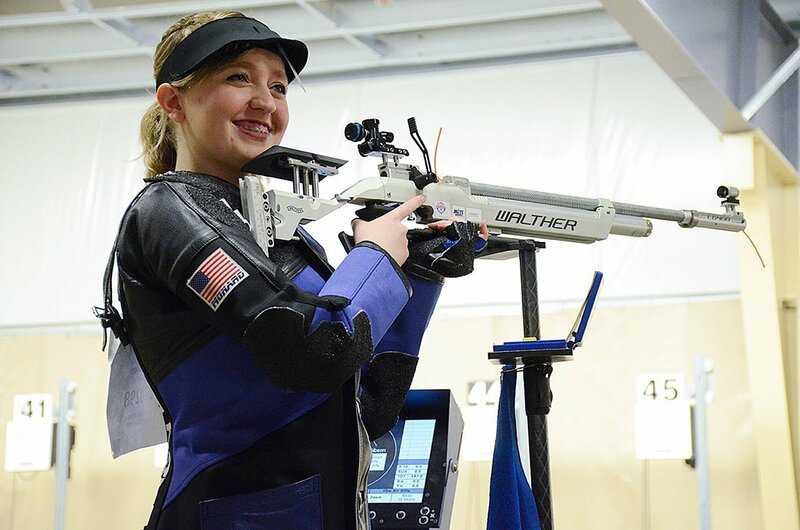 The National Championship is a two-day competition that follows the same format as the Postal and Regional matches, where competitors fire in three positions—prone, standing and kneeling. During Nationals only, the Top 8 competitors of the day from the precision class and the Top 8 from the sporter class then compete in a 10-shot final, vying for daily gold, silver and bronze medals. 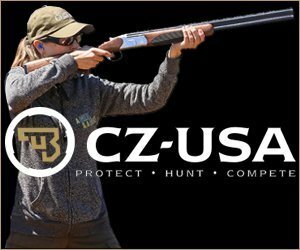 The Civilian Marksmanship Program (CMP) is a U.S. government-chartered program that promotes firearm safety training and rifle practice for all qualified U.S. citizens with special emphasis on youth. Its organizations, clubs, and associations offer firearms safety training and marksmanship courses as well as the opportunity for continued practice and competition.